If you will be in the Riviera Maya on February 14th this year, and you have not done a lot of planning yet for the big day, then a romantic outing in Riviera Maya can help you & your loved one to have a memorable vacation. We promise, it will be one of its kind experience that will leave your partner spellbound. Whale shark watching, snorkeling, wave runners, fishing, dining on board or on the beach are just a few of your options, and why not do it while receiving service from the highly trained staff of Yachts Riviera Maya. Vacation planning usually takes a lot of time and it can sometimes be a bit overwhelming. So let’s make it easy for you. There are some fun and romantic things that you can do in the Mayan Riviera on your upcoming romantic vacation. Here is your cheat sheet for Valentine’s Day in the Riviera Maya! 1) IMPROMPTU PICNIC ON THE BEACH – Riviera Maya is home to many beaches that are private and still public. To name a few: Xca-cel beach, located to the south of Akumal, and Tulum, located south of Playa del Caremn. Hop on a yacht charter and get to the secluded beach. Grab a glass of some champagne with your partner. Spend the day strolling ocean side with no one but your partner by your side. On the beach you will be served your favorite local deli and cheese, olives, cold cut meats, a fresh baguette and some wine or champagne. 2) PRIVATE CATERED DINNER ON THE BEACH – All of Riviera Maya is dotted with sparkling white sand beaches. Choose your favorite and ask the crew to set up a special romantic beach dinner for you and your love. Dinner on a private beach is perfect for couples looking for an intimate private dining experience. Catered by professional chefs at your own private yacht, you will be served incredibly lavish cuisines in the elegant, ambient surroundings. 3) XCARET NIGHT SHOW WITH DINNER – The Xcaret night show is a fun evening out. Enjoy the natural attractions of Xcaret and step into a world of exciting performances and traditional music. With over 300 artists on stage, witness Xcaret night show, a musical journey that takes you through the history of Mexico that exhibits dances, costumes and an unforgettable Mexican celebration. Make your partner feel special on February 14th, enjoy a special Valentine’s day dinner while watching the night show. 4) TAKE A TRIP TO A CENOTE – If you have not been to a cenote yet, then this is your chance. It is a wonderful place to snorkel, have an adventure and just spend time with your partner swimming in the crystal clear water. For a one of a kind diving experience like no other, take the plunge into one of the Cenotes of Riviera Maya such as Casa Cenote, Azul Cenote, Zacil-ha Cenote, Cenote Ik Kil, Gran Cenote, and Dos Ojos Cenote to name a few. 5) STAR GAZING – Even if you never took an astronomy class in college, you can still appreciate looking up at the night sky and seeing an infinite number of twinkling stars. Secluded areas away from the bright lights of the city are best for admiring the flickering sky and searching for constellations. Take your beloved on a moonlight walk and gaze at the stars. Make romantic wishes on shooting stars, or just lay back on a beach blanket and invent your own constellations. Still not sure where to go for the romantic outing in the Riviera Maya on Valentine’s Day? Romance is alive along the entire coastline of the Riviera Maya, take a little inspiration from the beach! With miles and miles of soft white sand, cool turquoise Caribbean Sea, and warm tropical breezes, the Riviera Maya is the perfect setting for romance. 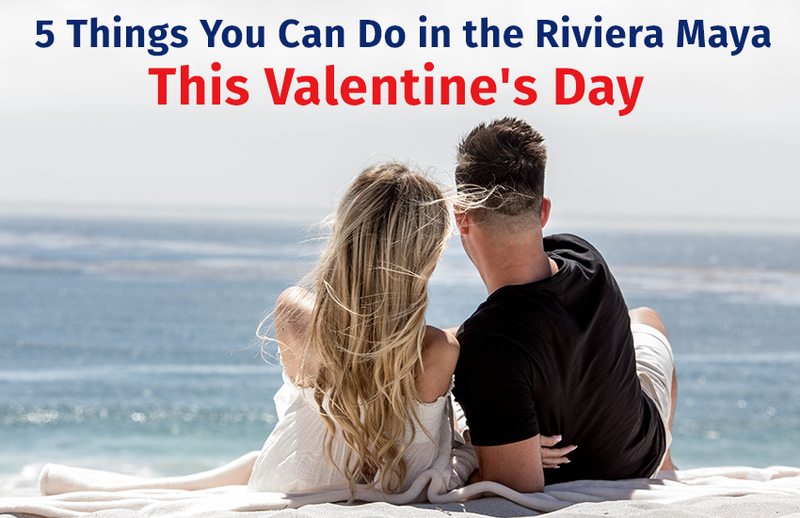 All you have to do is look to the beach for inspiration to make this Valentine's Day extraordinary.